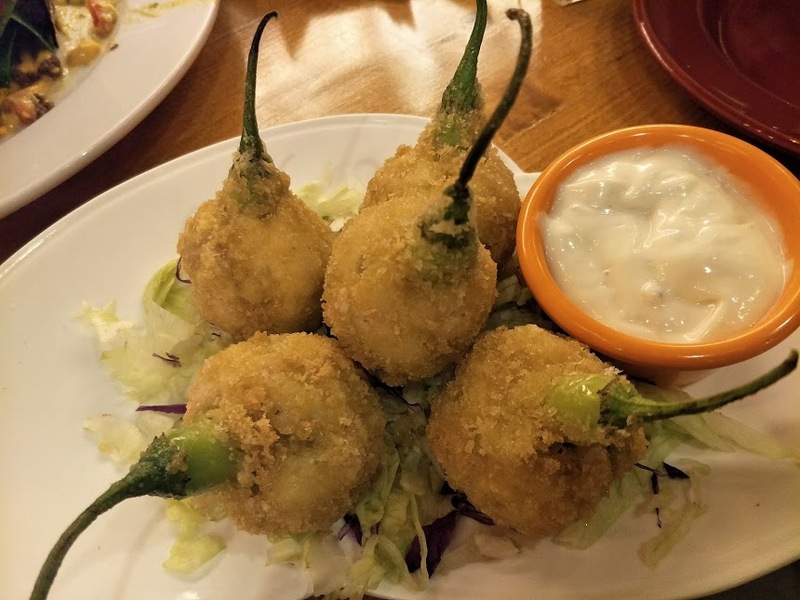 Tex-Mex or Southwest foods have been popular in the city for many years now, but sadly only one or two restos can serve authentic ones. 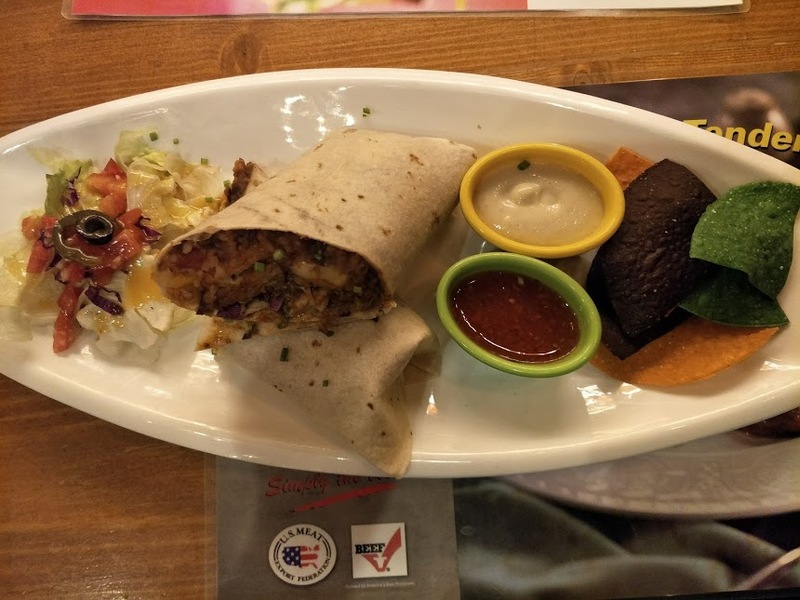 But it changed over two years ago when on December 2016, Fiery Style Southwestern Flaming Grill opened its first branch at the Mall of Asia. Serving a variety of Southwest favorites, Fiery Style has become the perfect place for lunch, dinner or late-night cocktails with friends. It has grown quite popular in the dining scene, not for its bar-scene but because it is a go-to family dining place. 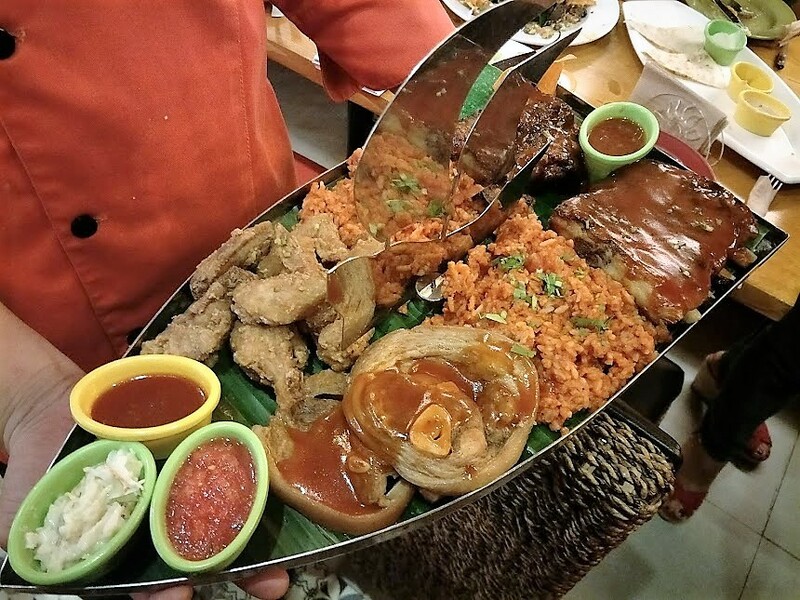 At Fiery’s, you can experience sumptuous meals such as the following best sellers we ordered and ate at their branch over at Resorts World Manila. Special thanks to Mr. Mat Ramillo Tee(Pres/Managing Director of Fiery Style) for guiding us to many of its special dishes. Eating your Salad is more fun at Fiery’s. 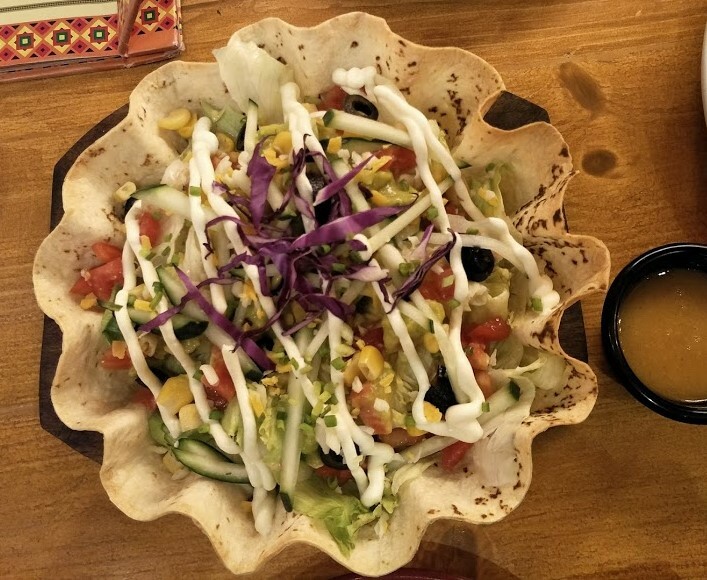 Served in a crispy Tortilla basket, you have the option what base your salad can be then mix it with Onions, Peppers, Cucumber then topped with Corn, Avocado and Tomato salad. Fiery’s serves the BEST NACHOS in town, it’s a given fact. Just look at this video. 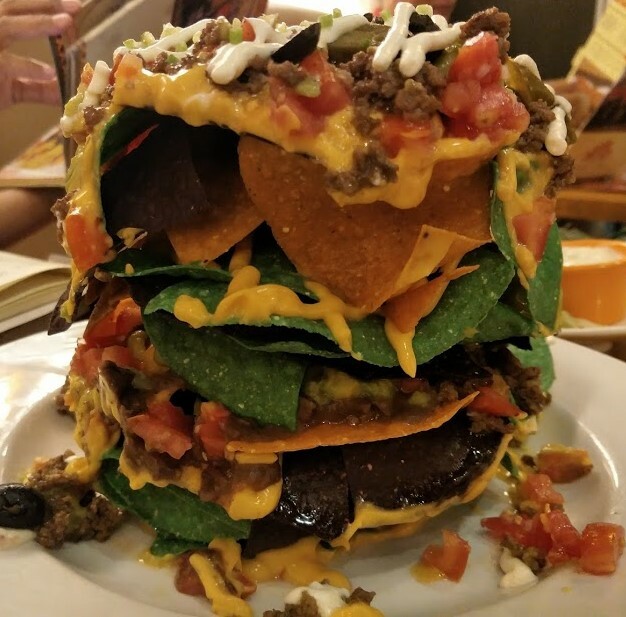 It does not only look good but delicious as well, with layers upon layers of nachos topped with Nacho cheese sauce, Guacamole, Tomato salsa, Jalapenos, sour cream and your choices of fillings. Deciding its not really Southwest if we did not order Quesadillas, Tacos and Burritos, we go all out and had them. 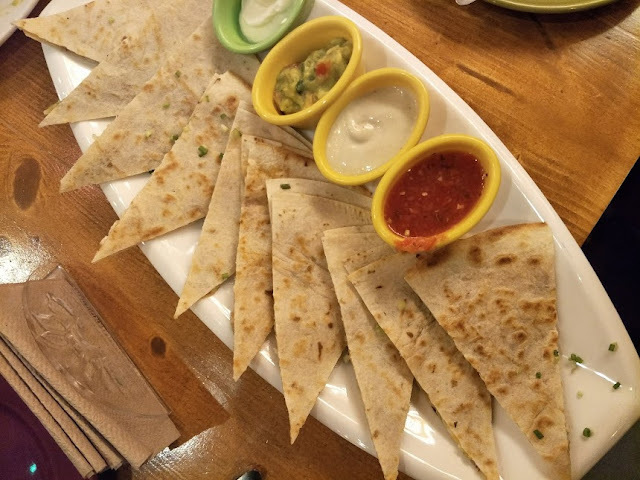 My favorite is the Cheesy Quesadillas which is crispy and made cheesier with Mexican cheese. Aside from lettuce, you can have your choice of filling and it comes with Guacamole, Sour cream and Salsa. Fiery’s Burrito is one delicious, bursting roll of goodness. It is loaded with rice, beans, peppers and sweetcorn, Louisiana style sauce, cheese and Sour Cream. 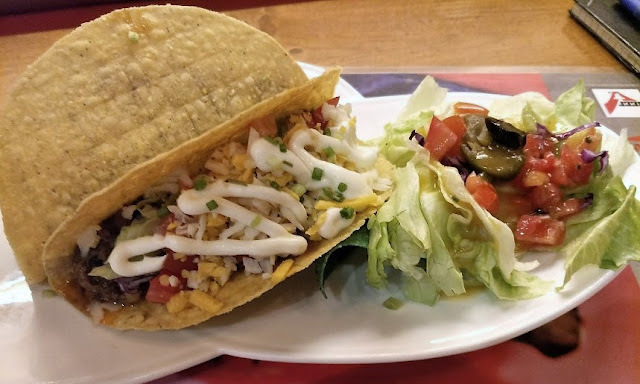 For Taco-lover, you will enjoy Fiery’s Terrific Taco which you can order either a flour one or the corn tacos. Still, both are crunchier and the Shredded Lettuce, Refried Beans, Mexican cheese, Salsa and Sour Cream makes it very filling. For the mains, the Galleon of Bones is a must-order one. Placed in a ship-like plate, it is filled with BBQ Ribs, Chicken Wings and meaty Pork Hammers and Beef Ribs and served with Southwest chips or your choice of Fiery rice, coleslaw and Texan-style BBQ sauce. It is very hard to choose what you’ll eat first but seriously all are delicious. Another popular dish at Fiery is the Lord of the Wings. 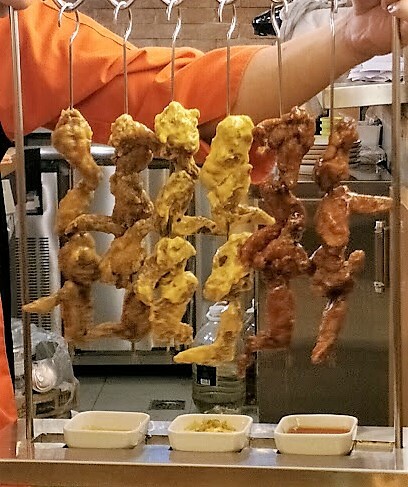 Artfully hanging in a metal rack, it consists of 24-pcs Wings, 8 of each is flavored with Hot, Hot, Hot Sauce and Jalapeno flavor, the finger-licking goodness of Nacho cheese and Bacon flavor, and the sticky Texan-style BBQ flavor. Recently, Fiery’s introduced its Mucho Fiesta Shareable p998. I’m telling you, this is a MUST-ORDER dish. 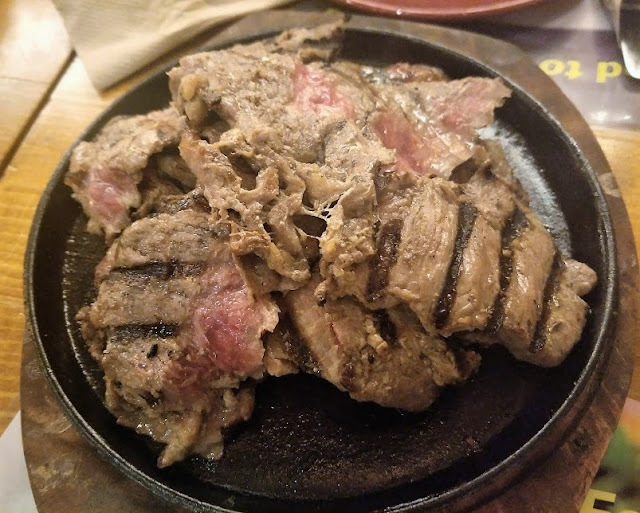 We ordered the Grilled Fork- tender Rump Steak and it’s literally gone in 5 minutes! It is tender, flavorful and more than a kilo of yumminess. No wonder it is now the talk of the town. 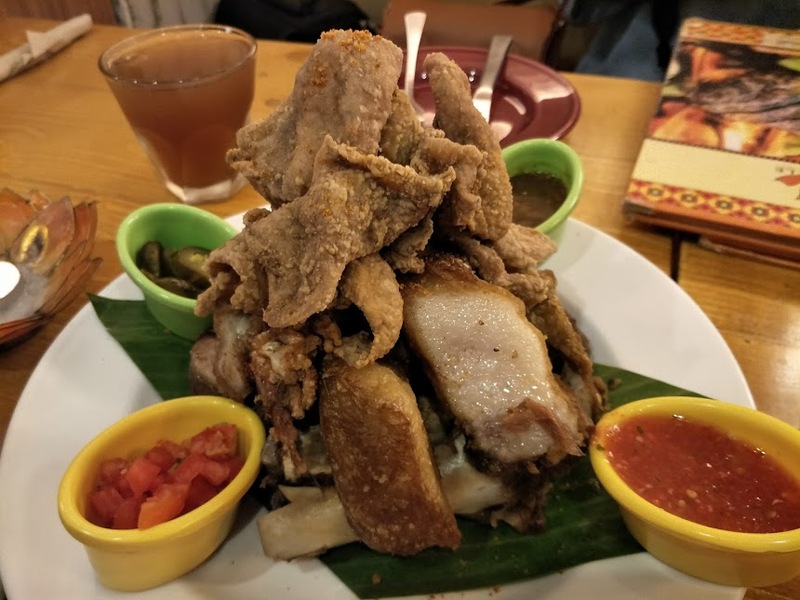 There is no other words to describe Fiery's version of Crispy Pata topped with Chicken Skin (yes, you've read that right) and the super hot, hot, hot Chicken Bombers. It is simply out-of-this-world delicious!!! Don't forget to order this whenever you visit Fiery's. I quench my thirst with Strawberry Paloma. Mixed with fresh strawberries and lime with Tequila, it is then shaken to enrich its flavors and taste. I love how the salt-rimmed glasses intensifies its flavor. For dessert, the Chili chocolate fudge p398 is a sinfully rich chocolate fudge cake served with vanilla or chocolate ice cream. 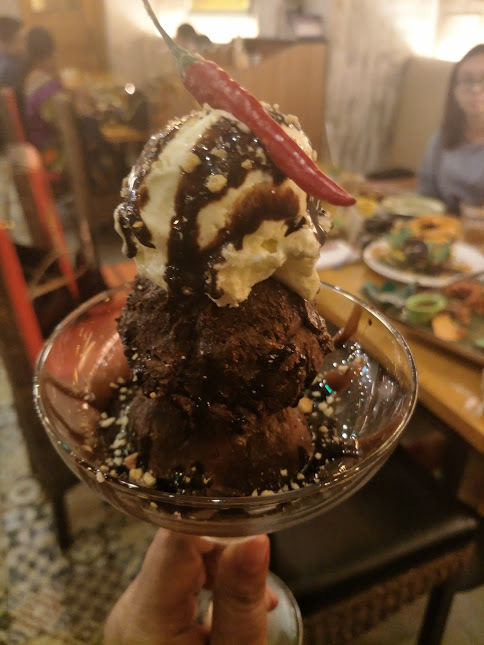 Topped with chocolate sauce and decorated with chili, this is one dessert you shouldn’t miss. 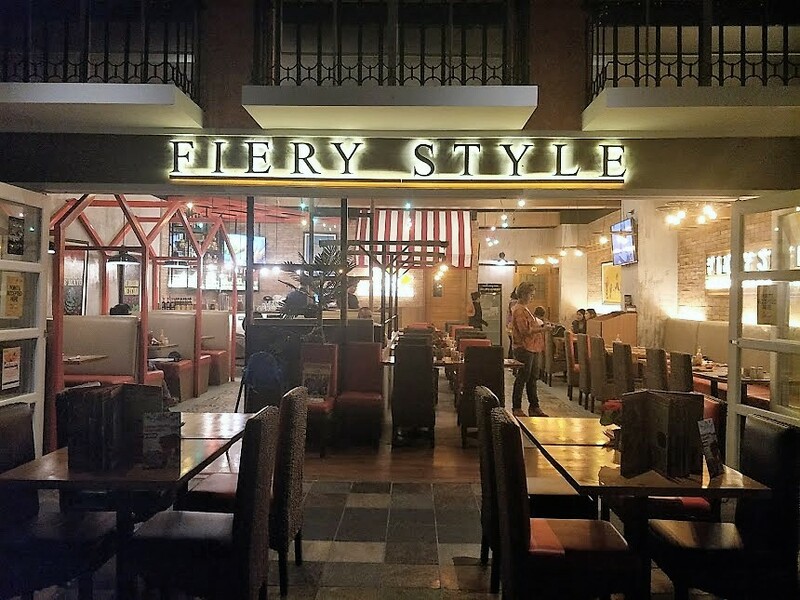 Fiery Style is indeed the perfect place for dining and drinking with a variety of weekly specials & promos. They have fresh fruit margaritas, Paloma, mojitos or a classic cocktail mixed at one of Fiery Style’s inside or outside bar. You can enjoy bottomless Mexican Cocktails starting at P278 available all day, every day! 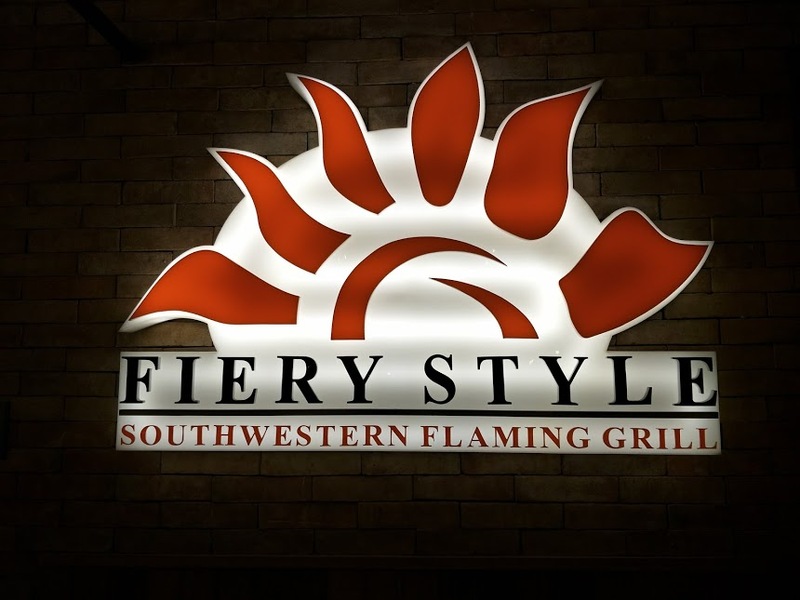 So, spend a night out with friends at the newest place to hang-out, the Fiery Style Southwestern Flaming Grill - Resorts World Manila. DJ and Acoustic performers are just nearby for entertainment every Thursdays, Friday and Saturday. Fiery Style Southwestern Flaming Grill with four branches now open located at Mall of Asia, Resorts World Manila, Festival Mall Alabang and Evia Lifestyle Mall with soon to open branches in Forbes Town BGC and Okada Manila. For more details and reservations, please visit our facebook at: facebook.com/fierystyleSouthwesternGrill and Instagram @fierystyle. Special shout-out to Mr. Migs dela Rosa of Mplify PH for taking good care of us during the late lunch.